Drive is a deceptively simple looking yet structurally sophisticated genre film by Danish, self-proclaimed fetish filmmaker, and non-driver, Nicolas Winding Refn (Bronson). Canadian Ryan Gosling plays a very quiet and reserved stuntman/mechanic/driver. Told through a patient, careful eye, Refn frames an embracingly entertaining narrative around Gosling's stoic driver for hire protagonist. The film, set in present day Los Angeles, has an astoundingly eclectic and incredible 1980s soundtrack and feel, underscoring a film noir plot and protagonist. Refn frames and structures the picture with so much reckless confidence, dazzling with stunning cinematography by Newton Thomas Sigel. With its defiant violence and intensity, Drive frames Los Angeles with energetic fetishism and nuance. The vision of L.A. at night is striking and illuminating. The slow pace and lingering shots defy conventional filmmaking, highlighting the graphic violence and powerful character performances. It sets a moody atmosphere focusing on unseen moments to create incredible tension paid off through violence. Golsing plays the unnamed driver and owns the screen with an understated, mannered performance, holding his emotions and motivations deep within. Every time he cracks a smile, the screen lights up. His performance is refreshingly quiet despite the thoughtfulness he hides. Never without his iconic scorpion driving jacket, there's a calm stillness to the driver's depth. The shooting script was reportedly a scant 81 pages long compared to the 97-minute running time. It shows. There's just the minimal of dialogue and story. Refn lingers on shots, building high tension and action through suspense. The plot is cookie cutter, based on a James Sallis' book of the same name. Reminiscent of The Transporter or various wheelman features, Drive unfolds to a heist gone bad. This driver lives by a strict code even when repercussions prove disastrous and tragic. There's not much substance, but the execution is flawlessly stylish. The supporting cast is superbly rounded out with stand outs like comedian Albert Brooks as the eerie villain, chewing up the scenery, and Bryan Cranston (Breaking Bad) as Gosling's loyal employer. 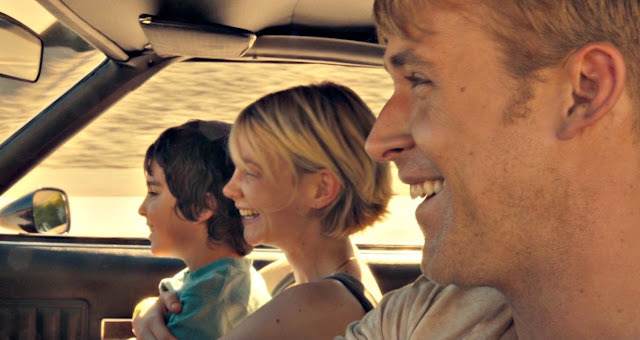 Carey Mulligan (An Education) serves as a suitable cypher, bringing emotion and feeling to Gosling's stoicism. Drive feels like a violent John Hughes movie directed by a 1980s Michael Mann. The careful composition and refined filmmaking make the film beautiful and exhilarating. Refn builds so much character with so little. The director alleges filmmaking is an "act of violence [...] penetrating emotions into an audience". The tension he creates has a great dream-like sense of danger. Silence permeates in every small moment. Refn and Gosling converge to make Drive a sure fire hard-boiled genre classic in the making with parallels to Scorsese and Taxi Driver. It's stunning and one of the best films of the year so far.